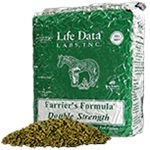 Farrier's Formula® Double Strength is a pelleted hoof supplement that can be added as a top dressing on the regular feed or given separately. It provides nutrients such as phospholipids, omega fatty acids, vitamins, minerals, and important amino acid “protein building blocks” for a healthy hoof and hair coat. 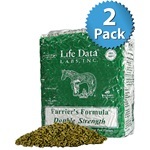 Farrier's Formula® Double Strength lasts twice as long as original Farrier's Formula®. 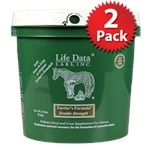 Farrier's Formula® Double Strength is available in 11 lb nitrogen flushed vacuum bags or 11 lb nitrogen flushed buckets. 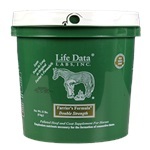 Farrier's Formula® Double Strength is doping free and can be fed to competition horses.